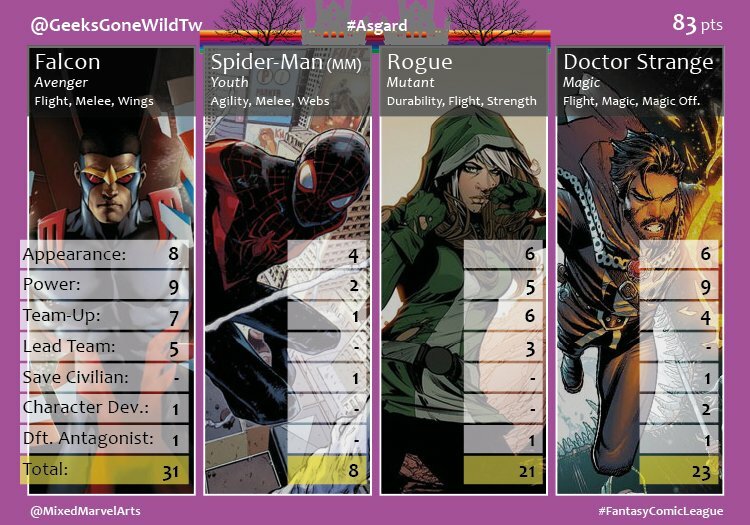 Having adjusted to their new “playground” on Midgard, the Agents of #Asgard reveled in the competition between their kin in the #FantasyComicLeague, fighting fiercely and with honor in a match that would keep spectators—and sages like me—guessing until the end. For the first three weeks, the Midgardian native known as Agent Seren (@Serendipity824) fended off each of the Asgardians, giving heavy credence to my belief about her birthright, but just as the interesting creatures known as Midgardian Bookies tilted the odds on her favor, Agent Geeks (@GeeksGoneWildTw) threw off his cloak and clawed to the top, ending the month in 1st place with 83 points. His belief in the Avenger, Falcon, paid off, and Doctor Strange, Rogue, and Miles Morales gave him the edge he needed against the native. 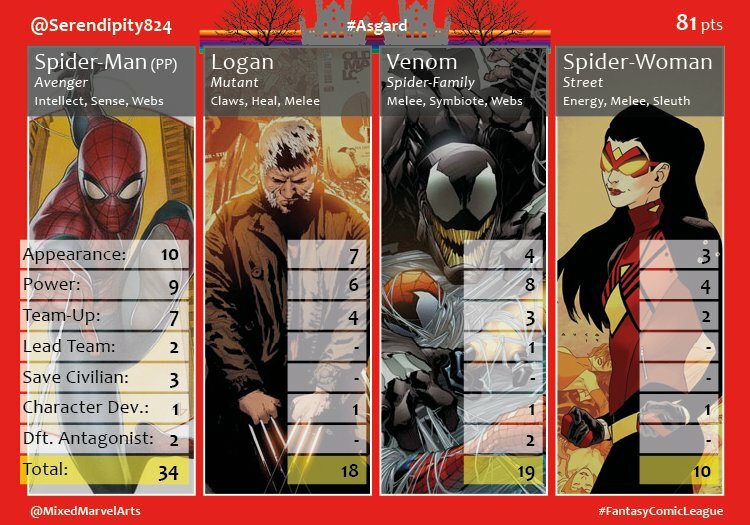 With her “spider senses” guiding her to recruit Peter Parker, Venom, and Spider-Woman, as well as Old Man Logan, Agent Seren just barely gave up her lead in the last week, ending in 2nd place with 81 points. 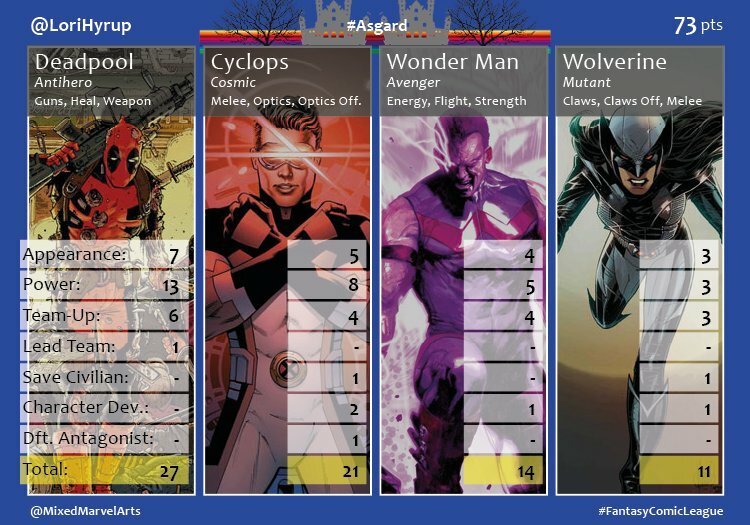 Agent Lori (@LoriHyrup), recognizing she had drawn too much attention to herself to month before, eased up on her battle fervor, and with a team consisting of Deadpool, Cyclops, Wolverine, and wildcard Wonder Man, finished in a comfortable 3rd place with 73 points. Just behind Agent Lori was the brave, valiant, and perhaps a little panther-feral, Agent Cham (@Cham_Arrow). 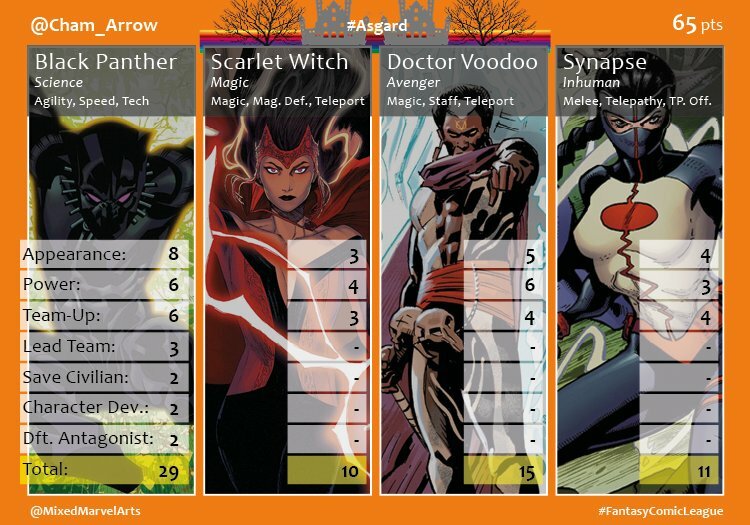 His champion, the Black Panther, served him extremely well, while the Scarlet Witch, Synapse, and Doctor Voodoo all provided supported but lacked a little bit in the follow-through. That brings us to the wonderful and wise Agent Pom (@pomwonderland). She has seen many heroes rise and fall through the ages, and she is in no hurry to rush towards Valhalla. So, she bides her time. 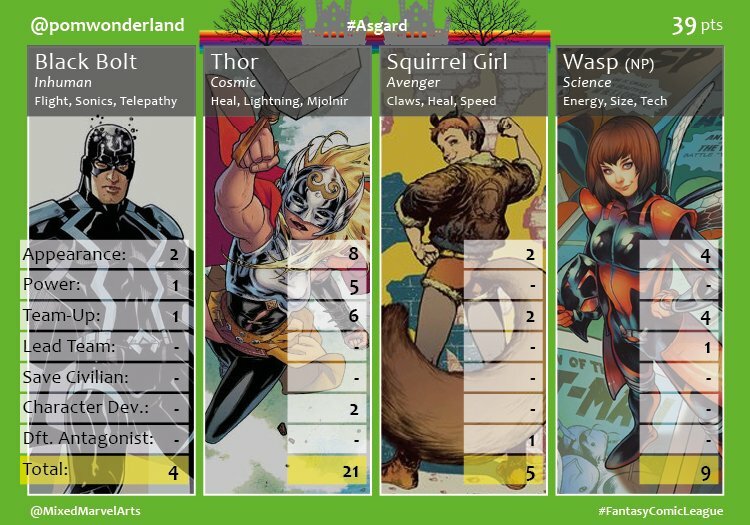 Finishing in 5th place with 39 points, it is clear that Black Bolt, Squirrel Girl, and Wasp did not provide the performance Agent Pom expected, but Thor, our great Goddess of Thunder, certainly shined. This competition is far more exciting than even I first predicted, and I find myself eager to chronicle these events as they unfold, to the envy of the sages who refused to travel to Midgard. I have also encountered a fascinating thing called pizza, which I’ll have to record in its own tale. Until then, I await the next round of competition between Agent Geeks, Agent Cham, Agent, Pom, Agent Lori, and that impressive Midgardian native, Agent Seren. Perhaps if I can get a sample of her blood, I can verify her heritage.